It is impossible to make up a fantasy tale that rivals the manifestations of the outlandish MF Global scandal. The evaporation of customer’s monies into an intentional off shore stash is tragic enough, but the indignity of allowing "no consequences" for a horrific crime against all investors is inexcusable. 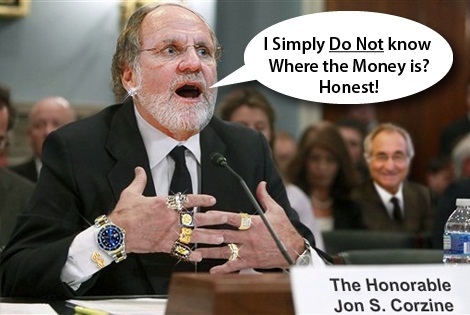 Jon S. Corzine is a fraudster that screams out for the gallows of justice. The manner of fleecing the public by Wall Street crooks has a clear distinction. Corzine walks while Madoff serves time. The original "Magical Mystery Tour" was a precursor of today's reality TV shows. Corzine’s version is more a "House of Horrors". The lack of definitive disclosure in the MF Global investigation is hampered at every turn. The stonewalling and cover-up is business as usual in the world of special selective prosecution. The frustration shows as Judicial Watch sues SEC, CFTC for Corzine, MF Global docs. "Judicial Watch said the CFTC acknowledged receiving the group's FOIA on April 25, 2012, but failed to provide a final reply by the statutory deadline of May 23, 2012. Similarly, the SEC told Judicial Watch it received the FOIA on April 25, 2012, but did not provide a final response by the mandatory deadline date. The American people deserve to know the truth about what FSOC officials knew about the epic failure of MF Global and when they knew it. But once again, the Obama administration refuses to provide basic information related to its 'oversight' of the private sector," stated Judicial Watch President Tom Fitton." Judging from public polls the attitude towards this dramatic crime hits hard at the diminutive confidence level, which goes a long way to cloud the entire financial community. If MF Global is an aberration, what is the problem of conducting an open and thorough probe that holds the thieves that stole customer’s money accountable? The public deserves answers. The Daily Finance illustrates this sentiment in the article, MF Global: The Hero, the Villain, and the Anticlimax. "During an online chat The Motley Fool held shortly after publishing our series on The Astonishing Collapse of MF Global, we polled participants on whether they thought criminal charges would be pressed, and if so, against whom: 71% thought someone would be held accountable and sent to prison. Most thought it would be Corzine. Others eyed JPMorgan CEO Jamie Dimon. Some thought a fall guy (or gal) would be found. But the idea that everyone would walk away seemed impossible. Ten months later, customers are still fighting for their money to be returned, and getting it in pennies rather than pounds. (A recent ruling will return $130 million more from the CME Group (NYS: CME) JPMorgan Chase is onto its next scandal involving customer accounts and the collapse of a brokerage firm. And Corzine, whose hands-on role at MF Global included roaming the trading floors, is considering starting a hedge fund." Crime committed among the protected Goldman Sachs fraternity is a foregone conclusion. Investor Daily offers up an even more disgusting prospect in Corzine’s Next Act After MF Global: A Hedge Fund. It looks like the vanishing of $1.5 billion is not a prohibition to running a new money scheme. "Amazingly, Corzine’s reputation may be irrevocably tarnished, but the latest reports suggest the ensuing criminal investigation is unlikely to lead to any charges against him. Of course, Corzine himself has yet to be interviewed by federal investigators in the 10 months since they began examining the details of the firm’s downfall, though it’s anticipated he’ll agree to such an interview next month." The infectious relationship between the Corzine Cosa Nostra and the Obama administration is sickening. The Goldman Sachs immunity of their crony connections just keeps on coming over at Eric Holder’s Department of Justice. Breitbart cites: "The New York Times reported that Holder's Justice Department will not be criminally charging Jon Corzine or any MF Global executives in that case either. "The New American expands in an article by Bob Adelmann, Former MF Global CEO Jon Corzine Will Likely Get Off Scot-Free. "With the investigators passing on pressing for criminal charges to be filed against Corzine, there are several glaring ironies remaining. First, the huge bets that Corzine made with company money, and then with customers’ monies when the company’s funds were depleted, turned out to be profitable after all. Second, investigators are currently negotiating with O’Brien, the assistant treasurer from Chicago, to waive her Fifth Amendment rights in exchange for immunity for her testimony about what actually happened in those last days. Finally, rumors are surfacing that Corzine is about to start another investment company, this time a hedge fund where he will manage investors’ funds for them. There will be just one stipulation: they must have bad memories in order to play." A financial wizard like Corzine puts P. T. Barnum to shame. Who needs to gear up a forgery currency printing press, when people simply turn over their treasure to a confidence artist with Goldman Sachs credentials? Such surreal conduct in the world of Wall Street larceny is rarely so blatant. A mass exodus from entrusting your funds in third party risk financial instruments should be the logical response. However, in the bizarre environment of derivative deception and compulsory arbitration, the average saver has little security in the return of their capital. Once, farmers’ biggest hazard was the weather. Today hedging your crop with future contracts in a Corzine account incurs far greater risk. When the government ignores the crimes of major political donors and refuses to prosecute or recover stolen money, it promotes an outlaw system for and by connected elites. Such an absence of fair dealing in the Obama tour of duty deserves their own jail sentence.